By way of a slight change and as a means of reflecting his busy extended weekend’s driving on the autobahns of mainland Europe, David Instone presents a travel blog; an account of how he and long-standing Express & Star contributor John Lalley have just taken in three top-flight games on the Continent in the space of just over 24 hours. Quiet and relaxing, it certainly wasn’t. A goal for Schalke at the blue away end…..celebrated by a fan in the main stand. And, yes, this was the weather while it rained cats and dogs at Selhurst Park. There was a Wolves theme. There had to be. A bit tenuous but a link nonetheless…..
Over a manic Saturday and Sunday, we dropped in on the place where Wolves played their last major European tie, savoured a win by the team they met in the European Cup of 1958-59 and were greeted cheerfully by a German on a bike who spotted our gold and black standard-issue Molineux shop bag. Well, a club doing well in the Premier League does tend to be noticed beyond these shores. Our day kicked off with an exchange of early-morning messages on Facebook with Gwilym Machin to assure him as he checked in bleary-eyed at Glasgow Airport ready to fly south for Wolves’ game at Crystal Palace that he wasn’t the only one taking to the skies at some unearthly hour. He correctly guessed two of our destinations when we told him we were flying out to attend a couple of major games in different countries later that very day. All three of our chosen fixtures were top-flight ones and were selected with geographical convenience, stadium quality and match-day experience in mind. The first two attracted a total of 85,000 fans, so boxes were certainly ticked. 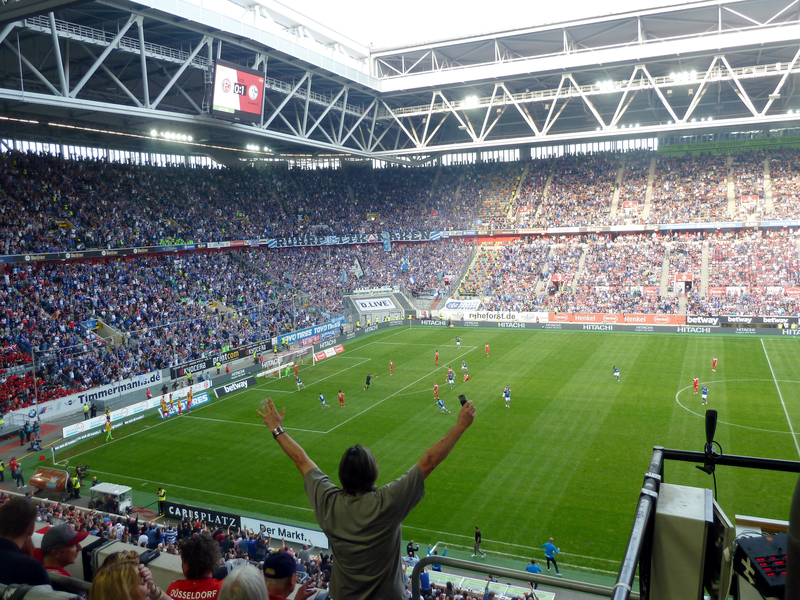 First up was the Rhineland derby between Fortuna Dusseldorf and Schalke and an epic afternoon given that the clubs hadn’t met in the league during the five years the home side had spent away from the Bundesliga elite. Not surprisingly, there was little recognition from the Schalke fans we engaged in chat outside the ground about their club’s victory over Wolves over two legs 60 years ago. It’s debatable whether they had even been born when Stan Cullis’s side were in their pomp. While covering the 1988 European Championships for the Express & Star, I had visited both Dusseldorf’s stadium and the largely uncovered one in Gelsenkirchen used by Schalke. What’s more, Molineux officials had found me out before departure and handed over plaques to include in my luggage and present to the host clubs as a way of spreading Wolves’ name. Fortuna are now in a stadium – one that looks quite extraordinary from the outside – built for the 2006 World Cup and we probably weren’t alone in the 52,000 attendance in thinking it could soon be a second-division home again, judging by their performance in Saturday’s 2-0 defeat. We missed the last ten minutes to make sure we arrived at our second venue in time for the 7.45pm kick-off – a mission accomplished just in time. But, rather than having seconds to spare when we took our seats, you could say we were 38 years late, given that it is that long ago since Wolves played there in the UEFA Cup. The close proximity to the Dutch border was all the incentive we needed to take in a game at PSV Eindhoven – one for which tickets virtually sold out after the host club’s seven league wins out of seven at the start of the season. Visitors VVV Venlo – how much alliteration can you get in one name? – resisted well in a magnificent setting under the lights and were in the game up to around the hour mark as they defended valiantly and created chances of their own. Maybe PSV suffered a bit of a hangover from their midweek Champions League defeat at home to Inter Milan but they turned on the style later on to win 4-0 and extend their lead at the top to seven points. Our nod to the past was to text Mel Eves at half-time in the Philips Stadion, both to tell him where we were and for a quick summary of the Palace v Wolves match he had attended a few hours earlier. He was the last Wolves player to score a European goal (in that tie in early 1980-81) and, before that strike on a Molineux evening on which the floodlights temporarily failed, he was close at hand when Andy Gray nodded an equaliser in the lost away first leg. The Philips Stadion in Eindhoven…..well worth a visit. Try as we did, we couldn’t find any Wolves links surrounding the last leg of our trip – a Sunday afternoon clash between Vitesse Arnhem and Heracles, won 4-0 by the home side. We must do better in our planning next year! Posted on: Tuesday, October 9th, 2018.